Use Excel's Get & Transform (Power Query) experience to connect to a PostgreSQL Database, which is an open source object-relational database system. 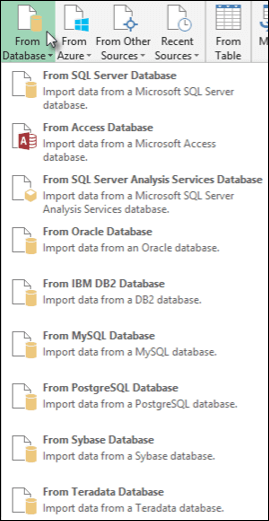 Note: Before you can connect to a PostgreSQL database in Power Query, you need the Ngpsql data provider for PostgreSQL installed on your computer. Select the driver that matches your Office version (32-bit or 64-bit). See: Which version of Office am I using? for more information. Also make sure you have the provider registered in the machine configuration that matches the most recent .NET version on your device. Click the Data tab, then Get Data > From Database > From PostgreSQL Database. If you don't see the Get Data button, then click on New Query > From Database > From PostgreSQL Database. In the Power Query ribbon tab, select From Database > From PostgreSQL Database. In the PostgreSQL Database dialog box, specify the PostgreSQL Database Server you want to connect to in the Server Name section.